Orlando, Florida is one of the most visited cities in the world for countless reasons. It is home to people from many different cultures around the world, making it one of the most vibrant communities that you will find anywhere. People also love the natural beauty, sunny weather, and delicious cuisine. But there is one thing that brings people by the thousands more than anything: The Walt Disney World theme park! Walt Disney World is just that - an entire world of fun and great energy. You will find all of the iconic rides like Space Mountain, Splash Mountain, and the Tower of Terror. There are ample opportunities for the thrill seekers out there, as well as those looking for a casual day at the park. Walt Disney World is broken up into The Magic Kingdom, Disney's Animal Kingdom, Epcot, and Disney's Hollywood Studios. The Magic Kingdom is the most classic of these areas, as it is where you will find these rides and the iconic Cinderella's Castle. Animal Kingdom is the world's largest animal theme park, featuring over 1,700 animals and a whole lot of fun. Epcot focuses on a future world and a park exploring all of the cultures of the world. Hollywood Studios offers the best behind the scenes look into Hollywood around. Regardless of where you spend your time, it is sure to be an unforgettable experience. A vacation can provide all of the unique attractions and activities, but an amazing place to call home will take it to the next level. 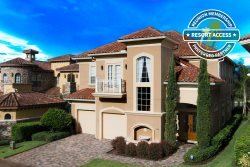 In our Disney vacation homes, you will find the most beautiful, convenient, and luxurious vacation rentals in the area. The designs of these homes are amazing, and the interiors are where you will find all of the comforts of home and some luxurious amenities you will usually only find in the swankiest of resorts. Fine furnishings throughout spacious floor plans provide for amazing places to gather with friends and family. Gourmet kitchens provide convenience to culinary endeavors, and features like high-speed Wi-Fi, washers, dryers, and much more offer some of the comforts you love about home. These are close enough to the theme parks to provide for amazing convenience, but far enough away to provide a feeling of seclusion and to avoid exorbitantly high prices. When you are looking to take advantage of the magical world of Disney, there is no better way to go about it than by staying in one of these phenomenal vacation homes. Browse the endless listings and find the perfect spot for you and your group!